Today, angry Teakettle villagers erupted in protest - demanding truth and justice from the police. 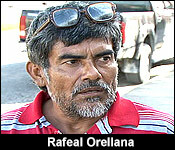 This is after 20 year old villager Edwin Antonio Baires Hernandez was killed by a pursuing police officer on Sunday. It happened within earshot of villagers - who were at a football game. They heard three shots - but last night on the news - the commander for National Crimes Investigation said that only one shot was fired - and it was an accidental shot to his knee that killed him. That narrative made no sense to the the villagers and convinced them that there was a cover - up. So today, in spontaneous protest they put burning tires across a village road leading to the popular tourist site, the ATM caves. Courtney Weatherburne has the story of what police did when they got there:..
Like an SOS alert written in the sand - Arizona villagers carved their message in the gravel with a heap of blazing tires beyond it. 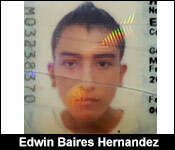 The villagers are demanding justice in the shooting death of 20 year old Edwin Baires Hernandez. "We are upset because we want justice because if one day it happen to him the next day it can happen to us or one of our family." 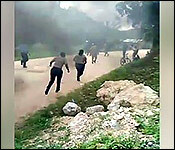 The villagers torched the tires around 9:00 this morning and as captured in this amateur video, the police were on the scene trying to chase after the fire starters. But it seems that the officers were more interested in confiscating phones than getting the scene under control. It wasn't captured in this video but according to a resident, it got physical. "When the police officers came they rush into us they said everyone on the ground and then they just grab us from our necks and threw us to the ground and suddenly they grabbed a young girl and they beat her, one of them grabbed her and the other was just knocking her." "From your understanding there are 3 persons detained from the village?" "Yes my brother and a next person and a lady." "So they area accusing him of starting the tire fire as well or just accusing him of capturing the incident?" "Well I don't know much, I only think of the videos because the other guy told me the BDF say that he got a video so they were chasing him." But beyond the video's, the alleged police abuse and even the blazing tires - all the residents want - including Hernandez's father - is the truth about his death. "The police said it was an accident but those who saw and all of that said it wasn't an accident because they chased him from the field and he fell in a private yard and that is where they killed him and the people say that it is 3 gunshot that they fired." "Just as they killed my son, I don't think it was fair what they did and what I want is that the police pay, if what they did wasn't right well to pay for the harm they did to my son." Up to news time - no one had been charged for the tyre fire. And the police Professional Standards Branch is still investigating the circumstances of the fatal police shooting. As we noted Baires Hernandez was shot to the leg, not the knee. I am unclear as to how disruption of the tourism in the area will benefit the villagers. If they manage to get ATM caves on the "not safe to visit" list then the community will lose revenue that it likely a boon to the area. Although I sympathize with the village as it goes through the grief of loss and their outrage at their police department, but peaceful protests and lobbying may be a more effective manner to achieve the results that are sought. Last time this happened in Teakettle, they did the same, but on the Western Hywy. That was after one of the villagers was missing and the police did not respond. Well, they found out how to get the police to respond. I doubt anyone in that village was thinking about tourism. Or ever thinks about it. 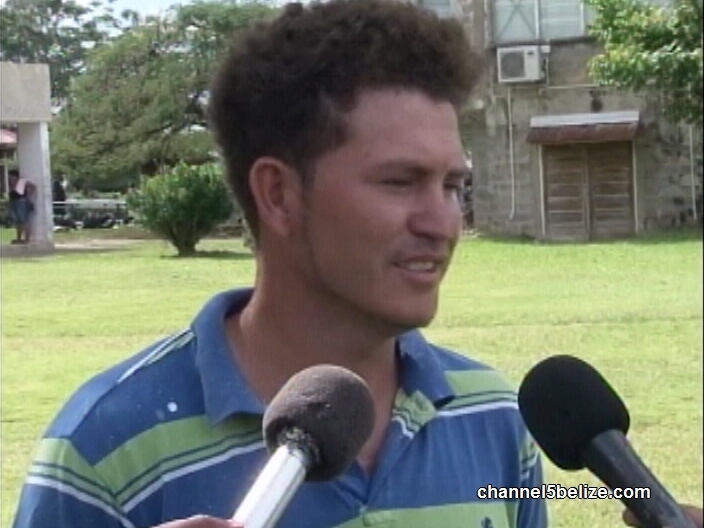 Three residents from the Arizona area in Teakettle have been charged for illegal assembly at the Belmopan Police Station. Twenty-three-year-old Mervin Correa, twenty-two-year-old Guadalupe Guerra and fifty-five-year-old Plines Gutierrez were all charged in connection with a bonfire on Tuesday that blocked the entrance to the area. 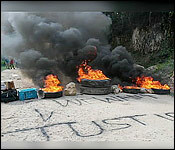 The burning tires was held as protest by residents to the police killing of nineteen-year-old Edwin Jose Hernandez this past Sunday in the village. In the wake of the protest, officers attached to the Special Patrols Unit detained the trio, who was subsequently charged today. 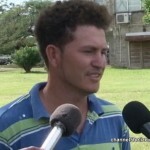 Victor Correa told News Five that the detention of his brother and others was because he took a video of the officers brutalizing a female resident. 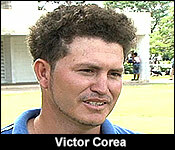 Correa and Guerra were both given police bail, but in the case of Gutierrez, the Salvadoran mechanic was also charged with illegal entry and as such, he remains in custody.